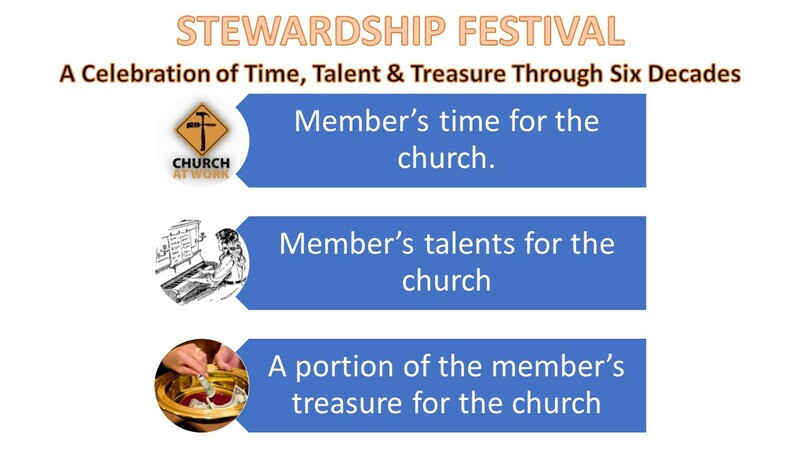 stewardship festival A celebration of time, talent & treasure through six decades. a new focus on growth and spiritual strengthening for the future of fort king presbyterian church. Working to keep our church grounds trimmed and clean. Helping in the church office. Serving on a church ministry. Working in the nursery on Sunday. Prepare & bring food/drinks on special events in Fellowship Hall. ​Make contributions to The Link. Volunteer to transport someone to Sunday service & other church events. Playing a musical instrument before the church. Serving as a member of Vacation Bible School planning committees. Singing in the church choir. Participating in the Sunday church service. Evangelize in the community; invite people to visit our church. Make contributions to the church website. Pledge a regular portion of your income to the church. Contribute to special needs and special church projects. Leave a bequest of money or other assets to the church in your will (real estate, stocks, etc). ​Contribute income from speaking honoraria to the church. The spirit spoke in a heart-whisper. Then, in a thundering bellow, it assaulted my ears. “Give your precious time,” it murmured. “Time to help, to plan, to dream. Reasoning time,” it bellowed again. It whispered anew. “I know your talents. You keep them secret from but a few. Reveal and export your talents. I crave your talents in actions,” it bellowed once more. For it sustains, permitting growth and Christian works. let the congregation hear this message. Allow your ears, hearts, and minds to respond.